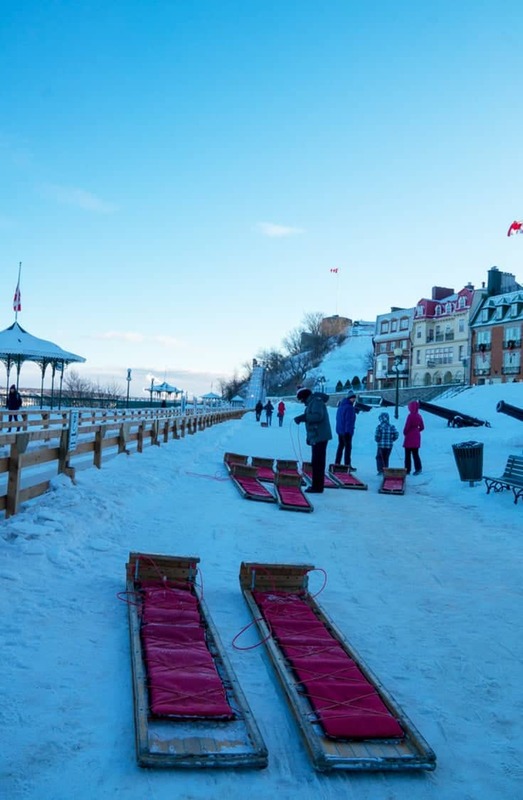 Quebec City is one of those Canadian destinations that brings smiles to travellers faces no matter the time of year. In winter, it turns into this magical winter paradise with a European vibe, cafes, restaurants and old architecture all covered in fresh white snow. 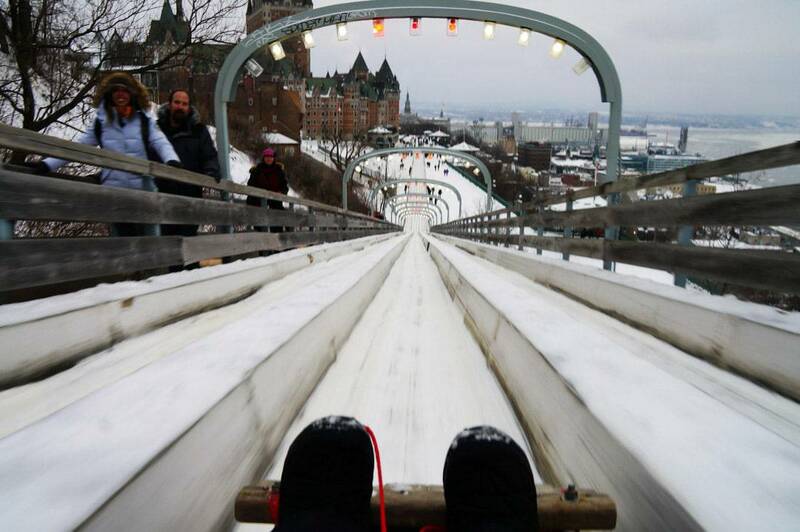 One of its biggest traditions is the century-old Quebec City Winter Toboggan Ride. 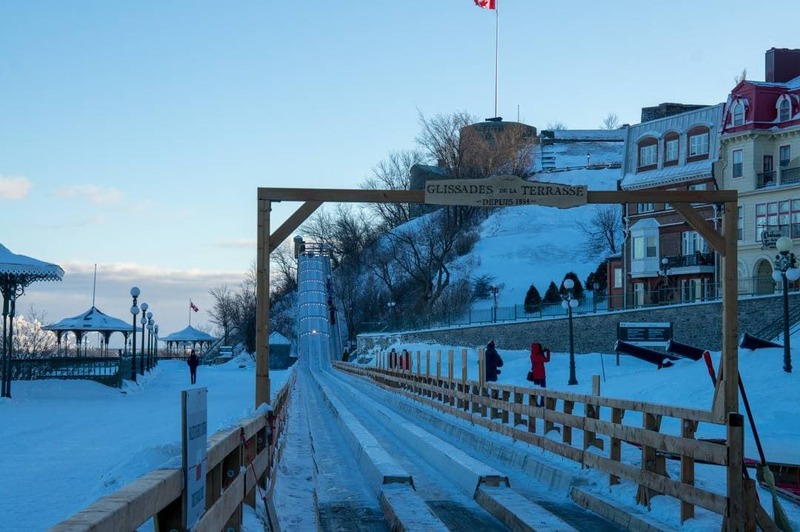 Located on Dufferin Terrace behind the Chateau Frontenac, the toboggan run is a winter tradition in the old city. Purchase tickets at the Kiosk at the bottom of the hill. There is also a small café and snack shop inside to keep you warm between runs. 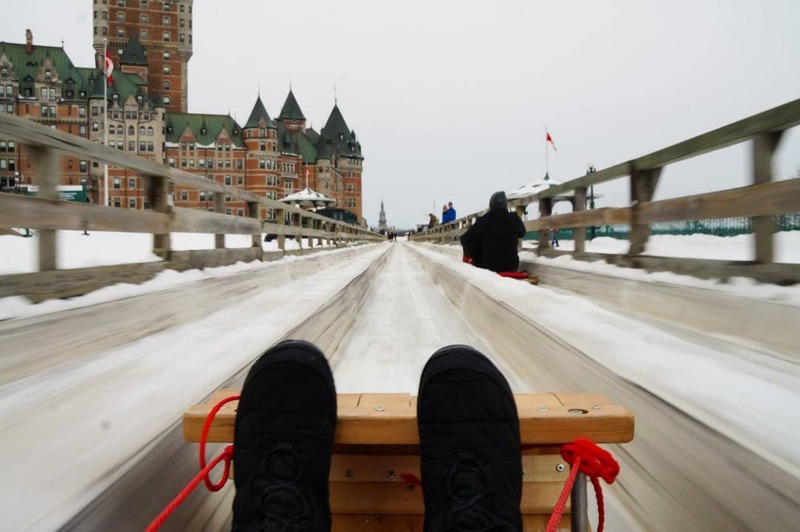 The Quebec Toboggan ride is open from December to March weather permitting. Its hours of operations are 9-5 daily with later runs in the weekend and extended hours during Quebec’s Winter Carnival. Purchase your tickets at the kiosk. You can buy one ride or multi-ride passes. The attendant at the bottom of the run will hand you rope attached to a long wooden toboggan. 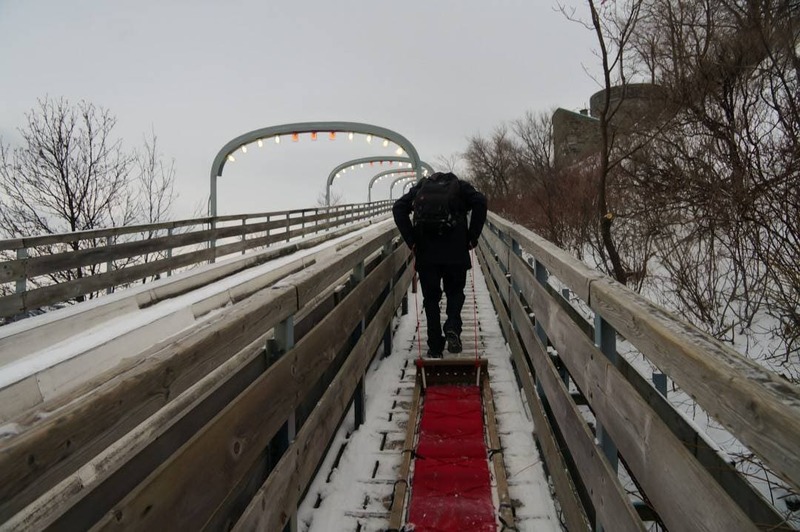 Wrap the rope around your body and make your way towards the inclined ramp with the toboggan gliding behind you. 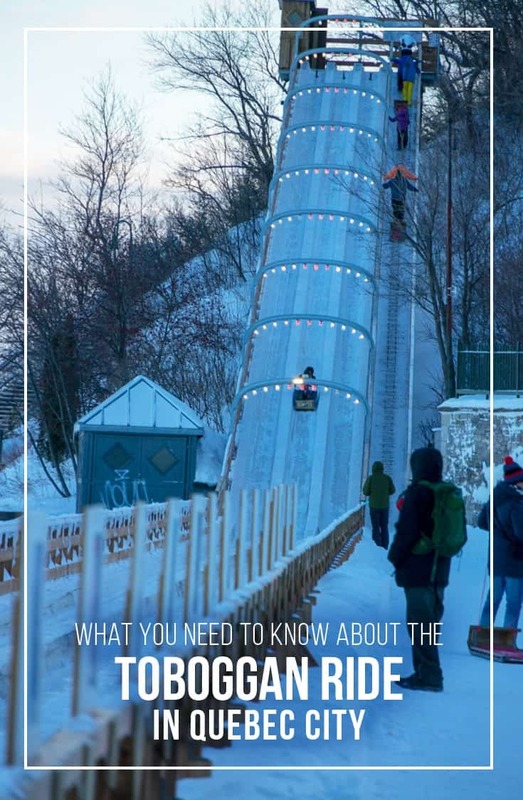 At the top, the attendants will put the wood sled into one of the three runs which will be held in place by a stopping mechanism. Once everyone is loaded up on their sleds, they will prepare you with a countdown. The stopping device will release, and you’ll begin your descent. This run is fast. Very fast. You can expect to reach speeds as high as 70KM/h. The boardwalk is very slippery in winter, be careful where you step as when covered in snow there are patches that are very slick. You will have to carry the wood toboggan up the hill yourself. There is a ramp with wood slots to keep you from slipping as you climb up. Wrap the rope around your body with toboggan behind you this will keep it from slipping out of your hands and sliding backwards into the people behind you. At the top staff will place the toboggan into one of the three runs. The toboggan will be rested with a stopper in front to allow you to sit comfortably. When everyone is seated and ready to go the stopper is dropped, and you will begin your run. It’s super fast. Make sure your hat and other loose items are securely fastened. If you plan on filming make sure your device is secured well on a good quality handheld tripod or with a head or body mount. Planning a winter vacation in Quebec be sure to check out these posts for more planning tips. Disclosure: Travel assistance provided by Tourism Quebec on a number of media press trips. The opinions in this post are my own. This page may contain affiliate links. Clicking through for additional information or to make a purchase may result in a small commission. For more information read our disclaimer.